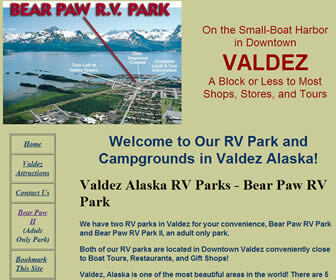 Are you the owner of Bearpaw Camper Park in Valdez Alaska? Did you know that you can convert this page to a complete listing of your services today for nearly nothing? Put your listing in front of thousands of visitors planning their trip to Alaska. Add your own coupons, pictures, services and more. Contact us today. Tell Your Friends About Camping in Alaska. Bearpaw Camper Park, Valdez AK. Sportsmen love Bearpaw Camper Park in Valdez Alaska for its prime location on the small boat harbor right in the middle of downtown Valdez. Read through the articles on Camping in Valdez Alaska and find out why this location rates so incredably high on the scale of places to go while visiting Alaska. Alaska Campgrounds is now on Facebook. Things To Do In Alaska! Alaska's Camping Guide is going through an exhaustive update to insure the information on this site is accurate and correct for the coming camping season. Please contact us if any discrepancies, errors or omissions are noted. The Unofficial Guide to the Best RV and Boondocking Campgrounds in Alaska and the Alaska Highway Camping Guide. © 2001-2014 Freelance Writers, Inc. All rights reserved. Redistribution or reproduction of any material is strictly prohibited.